It’s Pi Day! Possibly one of my favourite times of the year because two of my favourite things collide: (nerd) puns and pie! 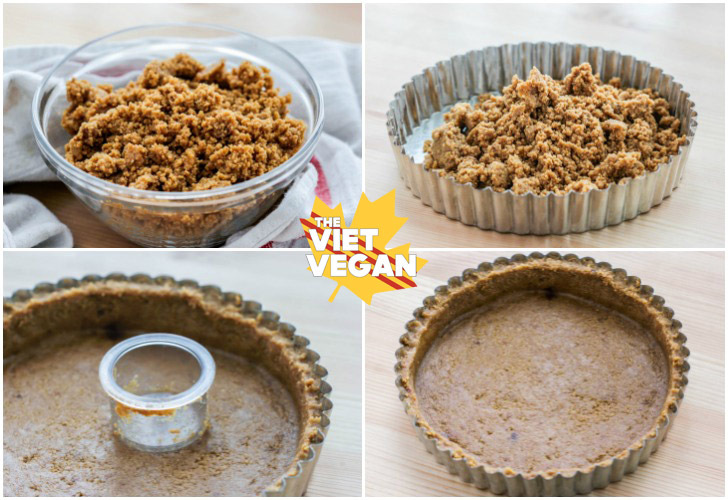 I thought for sure I would make something this year with my epic, foolproof vegan pie crust, but I didn’t. 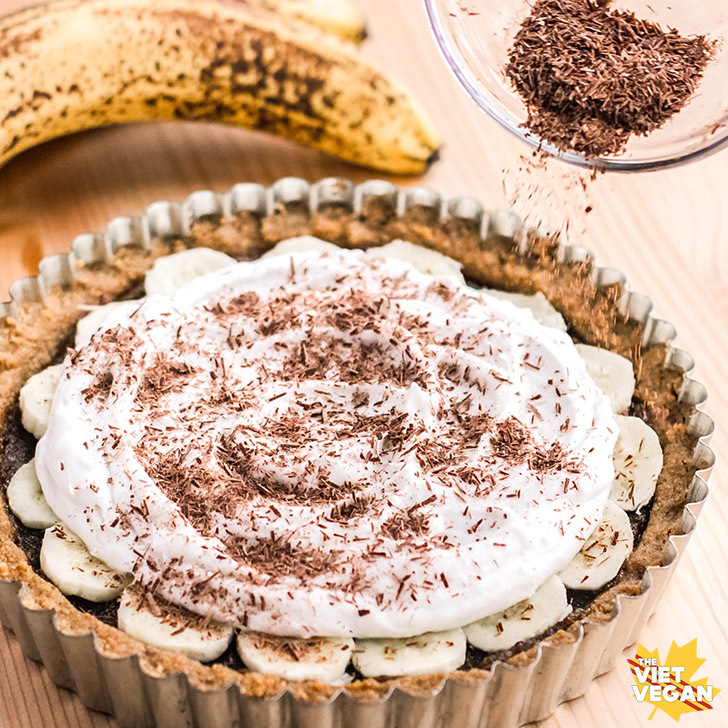 Instead I made this vegan banoffee pie, which isn’t EXACTLY like its dairy-laden equivalent, but it’s healthier and just as sweet. 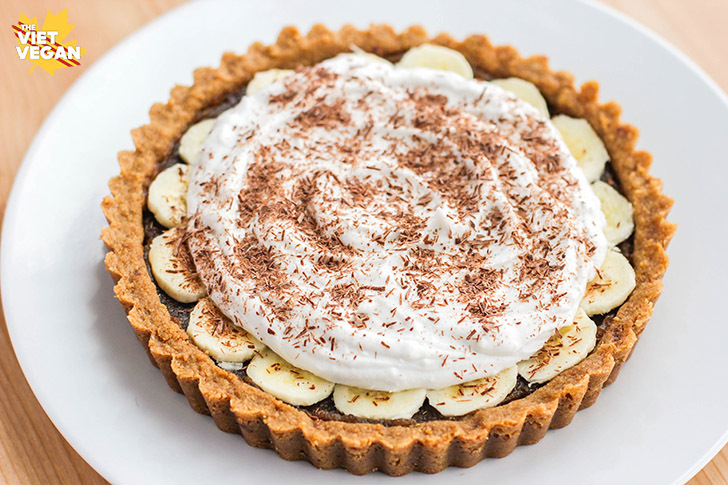 I considered cooking coconut milk down until it was like condensed milk and then into a dulce de leche like consistency, but I’ve done that before and it takes forever and ain’t nobody got time for that when they only have a couple hours to develop a recipe for vegan banoffee pie. And by “they”, I mean “I”. This weekend has been absolutely nuts. On Friday, I worked, baked a bunch of donuts and went to a wedding-sized celebration for my cousin’s first birthday party. Then, Eddie moved in on Saturday, so that entire day was spent trying to round up the last of his things, purge what he didn’t need (or that I already had or didn’t want because they were ugly ^^;), and unpack some of it so we had some of a living space again. Sunday I made this pie, celebrated a friend’s birthday, and then went to my old roommate’s graduating recital (she’s doing her Master’s of Performance in Euphonium! ), but all weekend I kept having these euphoric moments where I felt incredibly lucky to be able to do something for a living that is fulfilling for my own passions, goals, and the world. So many different things sort of cropped up that just made me step back and appreciate that my current job lets me do what I love to do. Growing up, I was always steered to pursue more “practical” jobs: jobs that had salaries, benefits, room to grow to support a family. People thought I was going to be a lawyer, or a doctor, or a scientist. I was a straight-A student (except for gym oops haha), band president, co-editor of the newspaper…I had a part-time job and I volunteered every week. On paper I was set for success. But the more job-focused I became, the more dissatisfied I became with my field. My first introduction to my passion was in high school. I took a photography class as my tech course and it ignited a curiosity that I never knew that I had. On a manual SLR (with film and moving parts!) I learned what ISO meant, how to load a camera with film, adjust aperture and shutter speed to take a photo with proper composition. I learned how to develop film and manually develop photos (in a dark room and everything). I discovered how much I loved capturing moments to tell a story, draw the eye, inspire someone to do something. I found my medium—aside from writing that is, but again, that’s another post for another day. I don’t think I really let myself dive into photography until I started this blog about four years after that first photography class. I had bought a DSLR camera and I wanted to take pictures of something that wasn’t flowers or buildings because those weren’t exciting to me. But taking pictures of donuts and cake were. Fast-forward several thousand photos and a few years, and I can call myself a professional food photographer. And I didn’t realize how important that was to me until I encountered those small moments. On Friday, I caught up with an old high-school friend who didn’t really know what I did for a living (for the record, I work in marketing, and a good portion of my job is food photography). I showed him some images from my most recent shoot and his response was something along the lines of, “Whoa…you’ve gotten really good.” Not that I think he doubted my ability, I just don’t think he ever saw any of my work since high school. I’ve grown a lot since then, so it feels pretty good to be recognized for something that you’ve worked really hard at that is meaningful to you. Not so great of a moment, but I was catching up with another friend of mine and he seemed really bitter about where he was in life and how the work he was doing wasn’t fulfilling. It made me think about what I was doing and I realized that I love what I do and that I’m incredibly lucky in the sense that I get to do what I actually love to make ends meet. Not everyone has that luck or luxury, and I’m sad that people have to spend time doing anything they don’t feel fulfilled doing. I think the world would be a better place if people knew what sparked that joy in themselves and were able to do it for a living. At my old roommate’s recital, I was able to see her just light up with pride and excitement over her repertoire and performances with her friends and colleagues, and I realized how happy it makes me to see my friends do what they love and succeed. There is nothing as inspiring as witnessing that spark of joy that only happens when you do something you love. I made a pie. 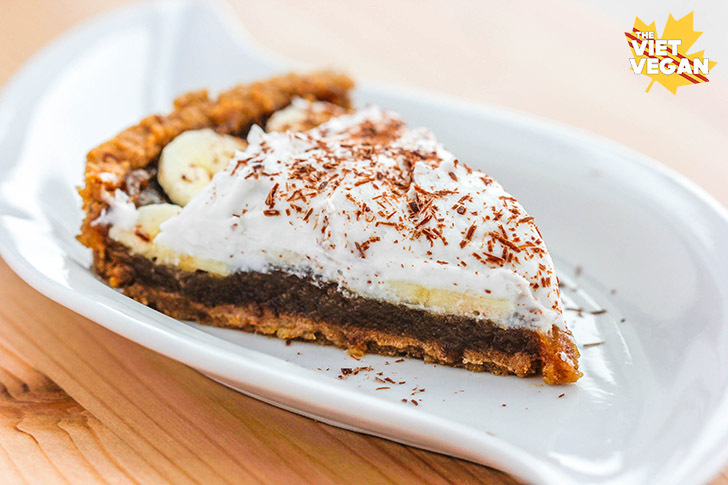 Simply because I wanted to, and I have readers that want pie. Like what the frack, that is awesome. 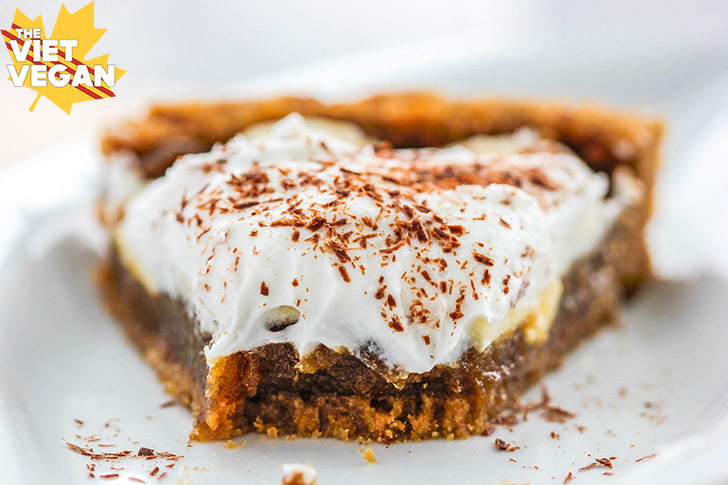 Last year I made my epic vegan pecan pie, and the year before I made a French Silk pie, and they’re both still really popular today and I’ve heard great things from the people who’ve made them! I totally dropped it as I was shooting it. I lent my cake stand to my aunt and so I just had my plate, which isn’t as flat so the pie just sort of slid off and hit the window on the way down. I managed to humpty-dumpty it and salvage that one sliced piece above, but this is what the rest of it looks like. It was kind of the cherry on top to this Monday because my weekend has been incredibly stressful but SO FUN and I wouldn’t have it any other way. This pie kind of summed up my weekend perfectly: things got messy and didn’t quite go according to plan, but it all worked out. Combine melted butter, graham cracker crumbs, sugar, and cinnamon until thoroughly mixed. 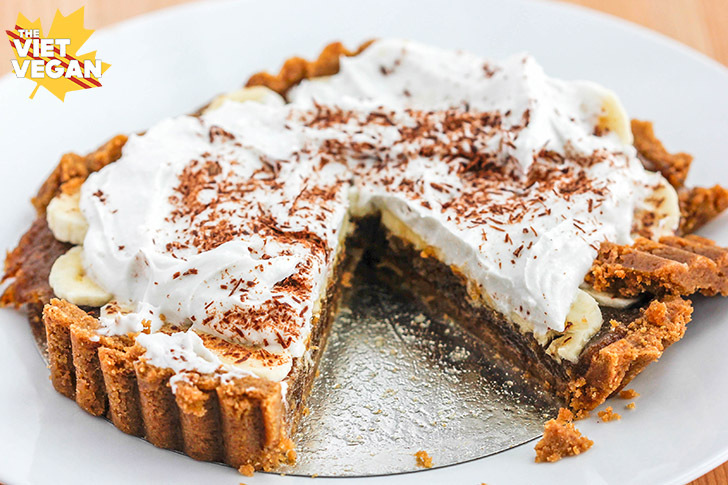 Press into a lightly greased pie pan and bake for 10 minutes. You'll find the crust is puffy when you pull it out: you can either leave it as is or you can use a bottom of a glass (or the insert from a food processor like I did) to press the crust down again. I like a firmer graham crust so I pressed it again, but if you like it lighter, you can leave it puffy. Let cool on a wire rack as you prepare the filling. Pit and chop the dates. You can choose the blend them with the water and vanilla extract for a super smooth filling, or you can leave it sort of rustic and chunky. I blended it. In a small pot, cook the filling until thickened and bubbling, about 10 minutes. Add filling to the crust and refrigerate to set up for at least an hour. 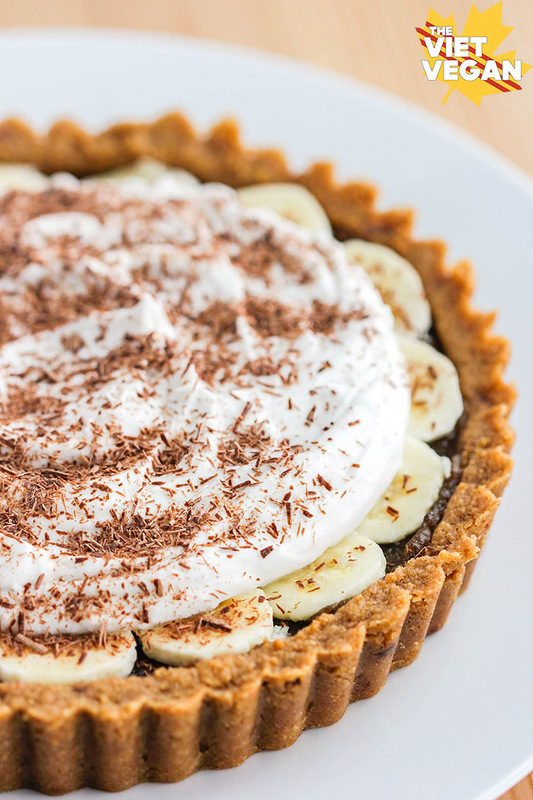 Once the pie is chilled, add a layer of sliced bananas. Drain the separated liquid from the refrigerated coconut milk, and scoop out the solid cream. Whip with icing sugar and add on top of the sliced bananas. Sprinkle with shaved chocolate and serve! Sounds great, but it's not vegan if there's butter in the recipe (crust). Has anyone tried the filling with a different crust recipe? Hey Anna! I guess I'm just so used to my vegan bubble that I can just call vegan butter, butter. I used Vegan Becel for this recipe. I'll fix it in the recipe ingredients. What size was the pie pan in cm thanks ? Ah that's so cool! Congrats on the job! 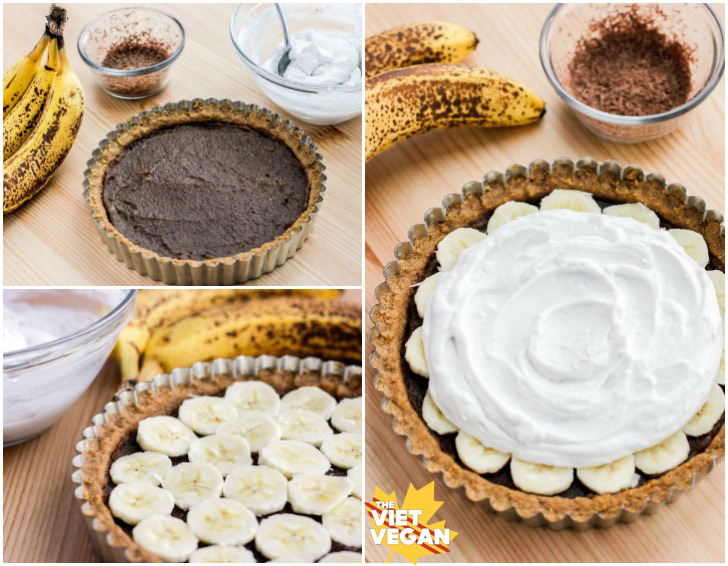 Hi, I’m making this pie for my vegan boyfriends birthday :D I will have to make it the day before tho. Will the whipped cream stay solid if I prepare it the day before and leave it in a separate container?Thanks! Hi! Sorry for getting back so late, but coconut whipped cream should stay solid in the fridge, you just may need to rewhip it the next day after refrigerating.